Generally the roads, with their porticoes, sidewalks, fountains, votive aedicules, wells and workshop entrances, constituted a space for community life, as well as today in modern cities. At Libarna several paved roads are still well preserved. The orthogonal road network (with intersection at right angles) was arranged along two major axes: the cardo maximus, running North to South, and the decumanus maximus, from East to West. All the other roads, called minor cardines and decumani, paralleled these two. The urban road network integrated that of the territory. Indeed the major axes usually consisted of the extension of the main territorial ways within the urban walls. 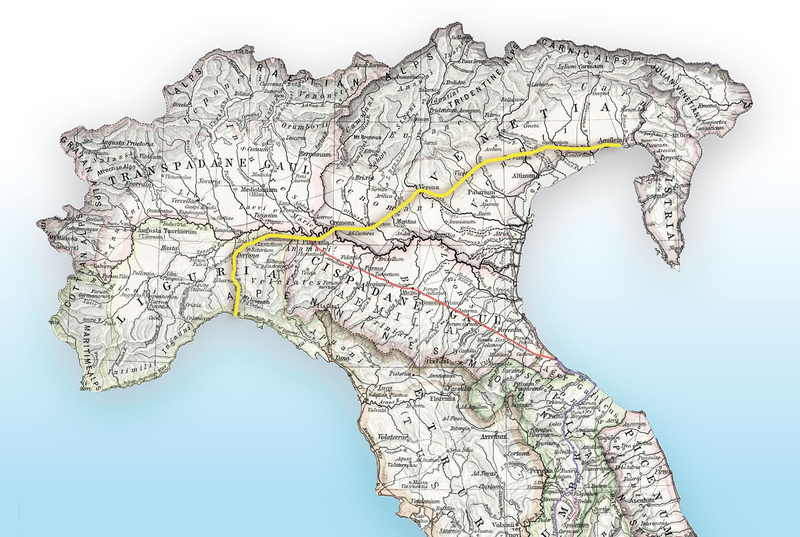 At Libarna the cardo maximus corresponded to a stretch of the via Postumia, the great consular way built in 148 BC, which connected Genoa to Aquileia. The size of the roads varied according to their importance. The major axes were very large: the cardo maximus might have been as wide as 14 meters and the decumanus maximus about 10. Minor cardines and decumani were 5 to 9 meter wide. Also the type of paving depended on the importance of the road. The cardo maximus and the decumanus maximus were paved with stone slabs, since they were usually destined to the transit of heavy traffic (chariots), while minor roads might have been paved with pebbles or gravel. Usually the roads were provided with sidewalks, draining channels to remove rain, wells and fountains for public use, votive aedicules, several evidences of which were discovered within the archaeological area. Sometimes porticoes were present. In fact the roads were not only connecting spaces among various urban areas, but true venues for the community’s life.